MOOYAH Burgers, Fries & Shakes is a fast-casual, “better burger” concept serving made-to-order burgers, hand-cut fries and handcrafted ice cream shakes in a vibrant atmosphere with outstanding Guest service. Other Financial Requirements: Cash liquidity of $200,000 per location and potential franchisees must have a net worth of at least $500,000. WHY MOOYAH BURGERS, FRIES & SHAKES? 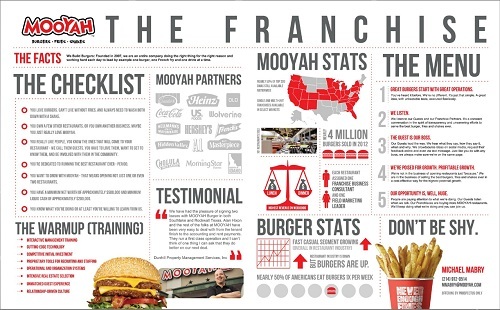 MOOYAH Burgers, Fries & Shakes is one of the hottest and fastest-growing “better burger” franchise opportunities in the world. The executive team created the business model with an obsessive focus on quality, consistency and the utmost Guest experience. You will be able to leverage our experienced management team to help you meet your development and business goals, and with nearly 50% of the top 200 DMAs available nationwide, the opportunities with MOOYAH are endless.